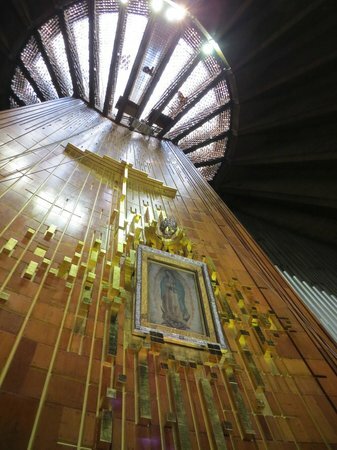 This photo of Basilica de Santa Maria de Guadalupe is courtesy of TripAdvisor. Today Catholics all over the world celebrate the feast day of Our Lady of Guadalupe, the appearances of the Blessed Mother to a poor Indian named Juan Diego shortly after the fall of the Aztec capitol city of Tenochtitlan to Cortez in 1521. Four times she appeared to him, dressed as a pregnant Aztec maiden, calling him her “son” and sending him to the bishop in Mexico City, where she wanted a shrine built. Instructing him to gather the roses that had suddenly sprung up on the hillside (out of season), she sent him back to the vision. And when the poor man opened his mantle, the roses had imprinted a miraculous image — and the original tilma with the image has survived centuries of devotion, still on display behind the altar, perfectly preserved, at the basilica. She is. And yet, not the mother I’ve always known. In fact, some days I think that the mantle has passed from her shoulders to mine. I wonder, Juan Diego, if you ever looked into the eyes of that Lady and wondered yourself. “Who is this person? And what does she want from me that I haven’t already done? When will she be satisfied?” I understand, more than ever, the desire to escape, to go around the other way. Then, in a flash, I see her again, and I feel a little ashamed of myself. How could I NOT see that she is, indeed, my own? I will not fear. For she is with me. And so, my Lord, are you. This fascinating icon, which I found on the Villanova University website, was written by Father Richard G. Cannuli. It depicts a woman of Middle Eastern origins, reminding us that Mary is revered by both the Christian and Muslim traditions (the Qaran refers to her as “Maryam”). And so it is fitting to ask her to pray for peace in the world for all her children. But in these recent weeks, I’ve found myself thinking about her more and more often, wondering what she would say to us about the pathway to peace even within our own land. During her own lifetime, the Holy Land was a hotbed of political unrest; zealots and Romans and simple families like her own just trying to survive in a climate often full of conflict and tension. As she saw her own son begin his public ministry, how she must have prayed as she saw him get drawn into the political turmoil. Where did she find peace, at such a time as that? As I watch my own children grow older, and their own lives erupt in conflict and confusion, the temptation is to rush into the middle of it, trying to solve their problems for them, trying to make them choose prudence. But at 15 and 17, that isn’t always going to happen. And so, when I cannot protect them … Mother Mary, stay close by, and pray for us all. Give us the peace that comes from knowing One who is never surprised by anything we do, loves us just the same. Recently I found this post over at Theresa Whitfield’s blog, listing an impressive number of individuals who share one thing in common . . . they were adopted. Gerald Ford, Faith Hill, Cyrus the Great — all these individuals became who they were because someone cared enough to raise them. As we celebrate the homegoing of Jesus’ Mother, may we anticipate the day that we will join her in the company of saints, adopted by God and full members of his family. We have nothing to fear, so long as we do not wander far from those welcoming, comforting arms. As you may know, the month of May is dedicated to mothers — and for Catholics, it is dedicated in a special way to the Blessed Mother, Mary the mother of Jesus. Have you written something about Mary that you’d like to share with a wider audience? Head on over to Sarah’s blog at “Just Another Day of Catholic Pondering,” and get connected with “Mr. Linky.” Sarah is a columnist at “Today’s Catholic Woman” on the topic of Mary. This should be a great Carnival. Check it out! We had been holding something similar at “Behold Your Mother,” but I’ve had so little time lately to keep that one current I’ve encouraged Sarah to bring this monthly tribute to the Blessed Mother over to her blog. At least for the time being, I’m going to give BYM a rest — cause every mother needs a break sometimes! “Look what we found!” exclaimed our son, Rob. As the oldest & tallest he was the default spokesman, thrusting a muddy mitt in my face, his fist clutching a clay encrusted hunk of plastic. “It’s Mary and I found it,” cried our littlest neighbor Maggie firmly asserting her role. “But it was in our yard,” hollered our daughter, Elizabeth. 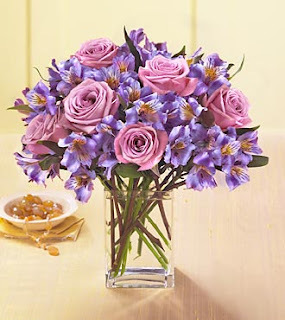 Happy Mother’s Day … to Extraordinary Moms! This week’s Catholic Carnival is up at “Organ-ic Chemist.” Be sure to check it out! Every woman on the face of this earth has been called to be one. Oh, yes … even you. The job description of an extraordinary mom has a bit of “give” in it, like your favorite pair of jeans. For some, it involves childbirth … many times over. Stretch marks and sore nips and the kind of pain that makes a bad case of cramps seem like a walk in the park. For some, the call involves sending several children on ahead of you to heaven. Or bearing with courage infertility within marriage or life without a spouse. And yet, even we have been called to spiritual motherhood. We can be godmothers, adoptive or foster mothers, or favorite aunties that always materialize to relieve exhausted parents at just the right moment. The only requirement, you see … is a willingness to be open to nurturing life wherever we may find it. To invest ourselves in the lives of other people. To come alongside those who are struggling. And to shine the light of faith so that others might know a truly abundant life. Extraordinary moms see opportunities to exercise faith where others see deprivation. We see opportunities to love when others see despair and aggravation. We see opportunities to hope when others see only what can never be. Lord, in Your mercy, make me an extraordinary mom. Holy Mary, Mother of God, pray for me that I might be more like you!